Prefabricated homes are growing substantially in popularity, and it is not at all difficult to imagine why. These convenient structures allow anyone to have a modern and sustainable home at the fraction of the cost of more traditional buildings. Not to mention the time factor. Opting for a prefab home can cut down an enormous amount of time involved in constructing, ensuring you get your own home in no time. Perfect for a family anxious to get a place of their own. 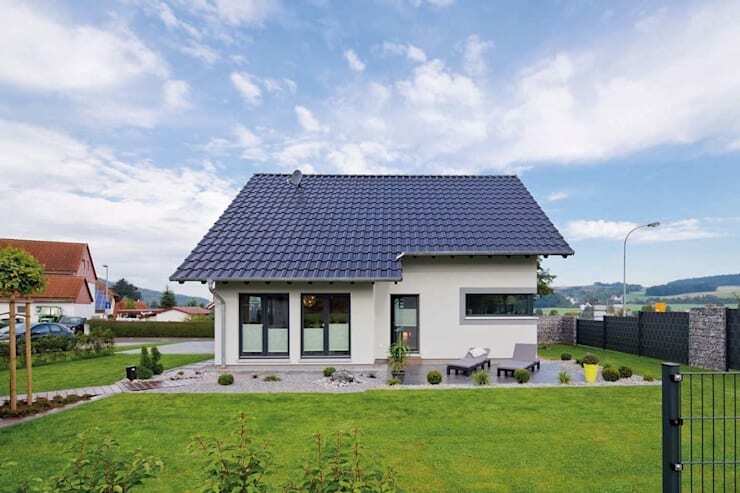 Today we will look at one such prefabricated home—a compact house that is perfect for a single family. Given a little time to explore this beauty, we are sure that you will be won over for prefab homes. If they all look like this, why do we need anything else?! Not convinced just yet? Join us for a tour and we'll see how you feel about it afterwards. From the first glance, we know this home is a keeper. 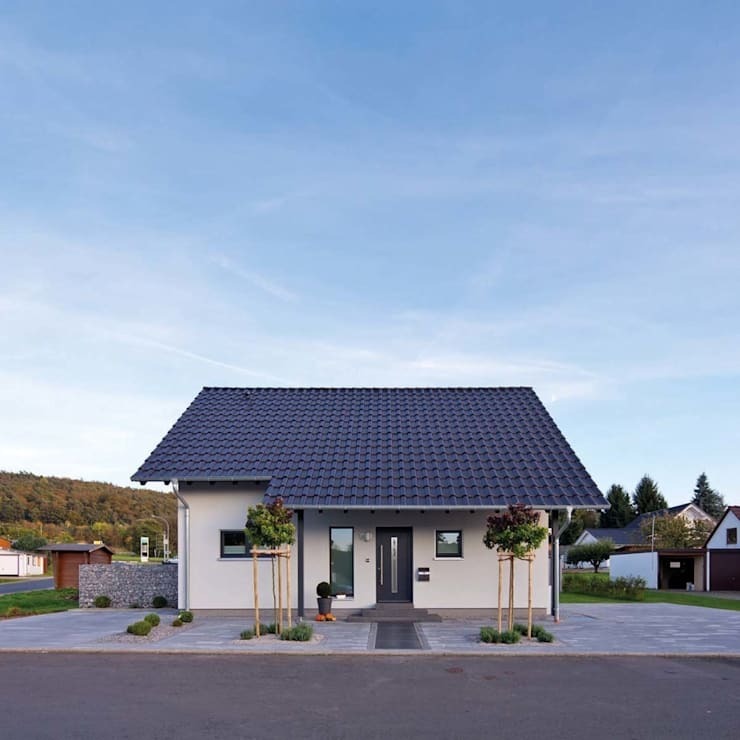 Meet the prefabricated VIO-100, a compact model family home from Fingerhaus GMBH. 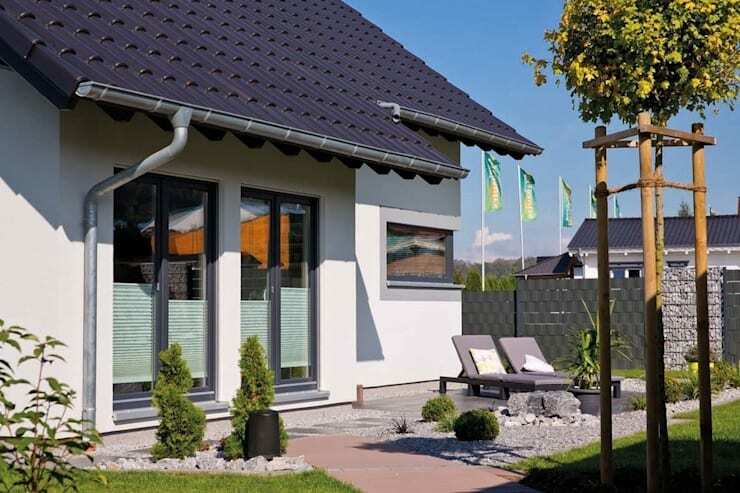 This company is no stranger to high quality and affordable homes, offering a wide range of sustainable and energy-efficient prefabricated solutions. They are so prolific, in fact, that we have already covered a number of their projects here on homify. Just do yourself a favour and go take a look at the ideal family starter home, explore the dreamy compact family home, or find yourself enthralled with the Grimm's Fairytale home. Whatever's your preference, Fingerhaus seems to provide a solution. 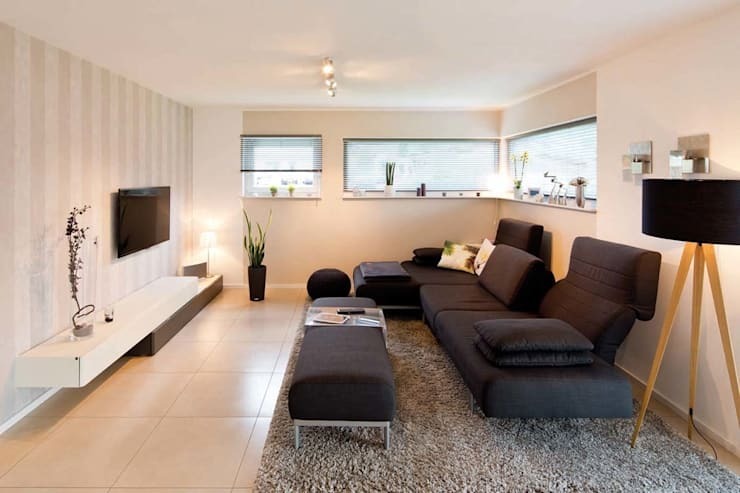 The common theme amongst these wonderful houses is the family-centred approach. Although the models are all rather compact and very cost-effective, they are all also made for family life. Here we can see the house from the street's side. It is a quaint little suburban home, which immediately conjures up nostalgic feelings of close-knit neighbourhoods and childhood. It certainly has a welcoming appearance, and must be a comforting haven to come home to after a long day at work. The compact building is topped off with a gable roof structure, a traditional staple which allows for sufficient water drainage as well as space for an attic. Now let's go take a look inside this compact home. Our first impression is definitely unexpected, as the spacious entrance hall makes it seem like we are dealing with a house of much larger dimensions than what the exterior looks like. The fact that the walls and ceiling are all-white definitely enlarges the sense of space and extends the visual boundaries. The furnishings and features of this space largely consists of natural elements and neutrally coloured materials. The beige floor tiles ads a sense of warmth, whilst not making the area feel smaller, as would have been the case with a darker or heavier colour. 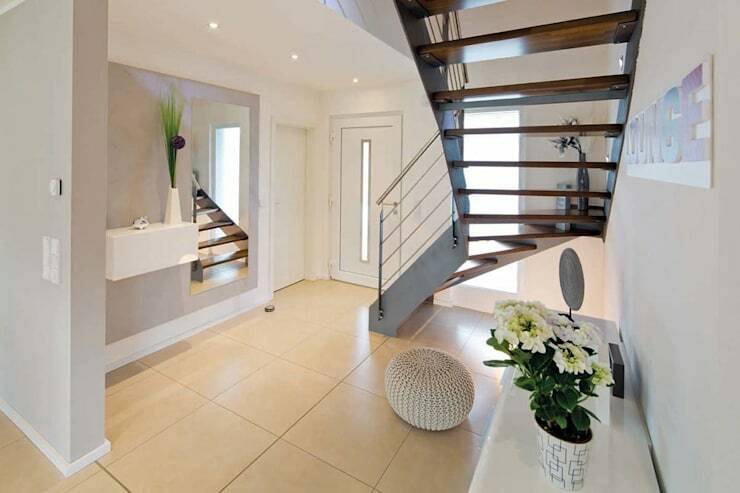 The wooden stairs contrast well with the steel railing and sides, making it a modern combination of materials. On to the living room! Here we are greeted by a warm, welcoming and luxurious space. The cold openness of the neutral walls, ceiling and tiles is broken by the addition of a highly textured grey rug, which instantly warms up the space and creates a gentler atmosphere. The furniture consists of a simple L-shaped couch and some ottomans. These are all upholstered in a rich, black fabric, which is softer on the eyes than leather, but still gives a very elegant appearance. As we can see, there is little no other ornamentation in the room, leaving the space uncluttered and clean. The dining room is another area in the open-pan triad of the living room, dining room and kitchen. This is a very elegant space, with subdued features that area still sophisticated and warm. This is well complimented by the large bay windows that face outward to the garden of the property. These large fixtures allow the dining room to be flooded with light, which then also flows over into the kitchen and other living spaces. The result is a fresh and airy living space. 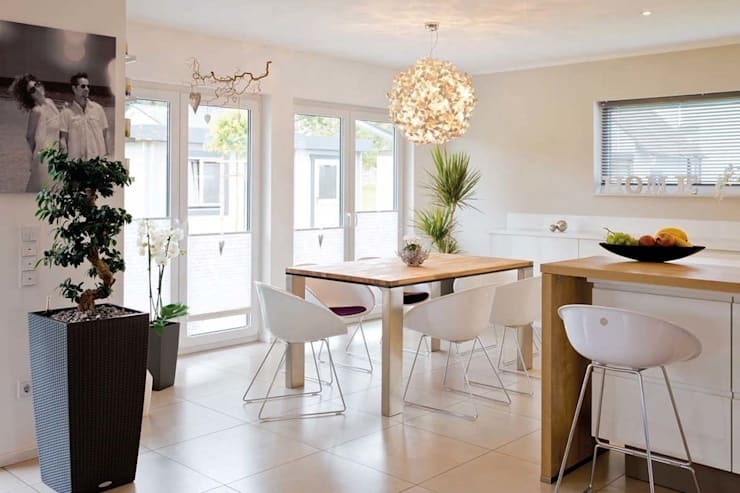 The dining table is a simple yet stylish wooden model, with light white chairs which draw inspiration from Scandinavian design. Above the table area hangs a beautiful ceiling lamp enrobed in paper flowers. This is not only a significant aesthetic effect, but also brings texture and depth to the room. Lastly, let's take a look at the family bathroom of the house. It is definitely not a bathroom that anyone can be disappointed by. The space is generous and large. It includes a free-standing bathtub, allowing for long, luxurious soaks in the tub for mom or dad, or fun bath time for the children. 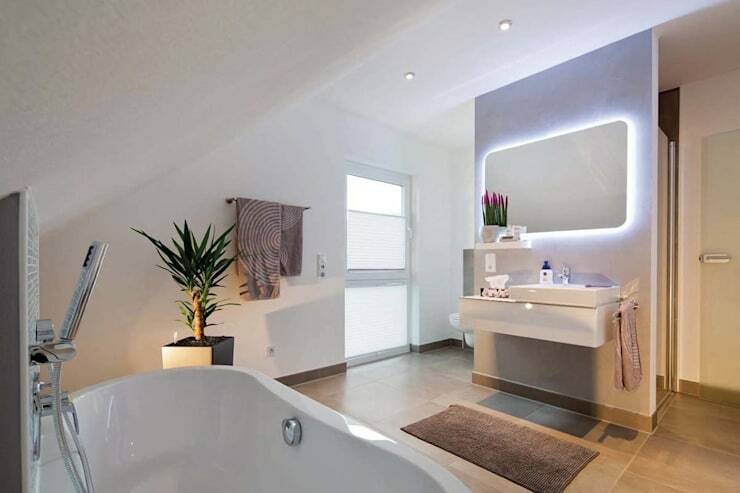 Above the bathroom sink is a large mirror with LED backlight, given the space a somewhat glamorous appearance. It is a house that has something for every member of the family! Are you considering a prefab home? We'd love to hear about it!